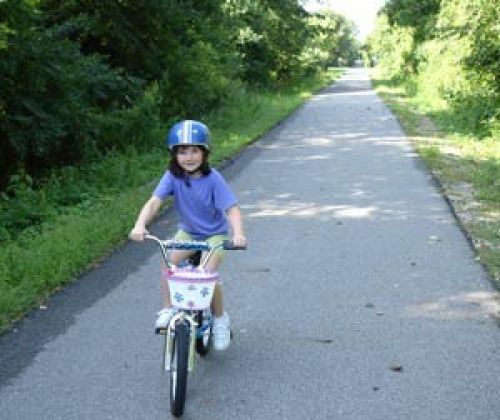 Summerset Trail – Stretching almost 12 miles through rolling hills, river bottom wetlands, and remnant prairies, this rail-trail allows for hiking, biking, or cross-country skiing through some of the best of central Iowa’s natural scenery. Location: Carlisle to Indianola, South of Des Moines, joins Carlisle on State Route 5 to Indianola. The Summerset Trail ties together a variety of natural settings as it travels through three public recreation areas. Built on a converted railbed, this trail gives visitors a glimpse of a number of central Iowa's rural towns and natural settings. Stretching almost twelve miles, the Summerset Trail passes through rolling hills, river bottom wetlands, and remnant prairies. Its gentle grade and paved surfaces provide nature lovers and recreational enthusiasts with a number of activities, including biking, hiking, bird watching, nature photography, jogging, and cross-country skiing. In addition to connecting some of Iowa's natural ecosystems, the Summerset Trail links three public recreation areas. At the southern trailhead, a connection with the McVay Trail in Indianola takes you to Pickard Park. This park features an 18-hole disc golf course, basketball courts, a pond, and camping and picnic areas where trail-users can rest and recreate. A trail spur connecting to Banner Lakes at Summerset State Park, Iowa's newest state park, marks the trail's midpoint. Fishing, picnicking, hiking, and mountain biking are available at this former coalmine, which has been converted into a wildlife management area and public recreation facility. The northern trailhead in Carlisle is also located within a public park and picnic shelter. In addition to a number of recreational facilities, visitors will enjoy the best of central Iowa's scenery. Passing through restored and native prairie remnants, lush wooded areas, and flourishing wetlands, the Summerset Trail reveals the diversity of the region's natural areas. The trail is managed exclusively by the Warren County Conservation Board, and local support has been given by the Iowa Natural Heritage Foundation. For more information, please see: http://www.inhf.org/iowatrails/summerset-intro.htm.